Ebem Primary School in Ohafia Local Government Area of Abia State has been awarded the 3rd best primary school in Nigeria by the Federal Ministry of Educatioon, Abuja. The school received the award after a thorough examination by officials of the Federal Ministry of Education who visited Abia State 3 times to verify manpower qualifications (28 degree holders, 13 NCE holders all with TRCN Certificates), full compliance with NERDC curriculum, cleanliness, classroom activity, infrastructure, facilities etc. 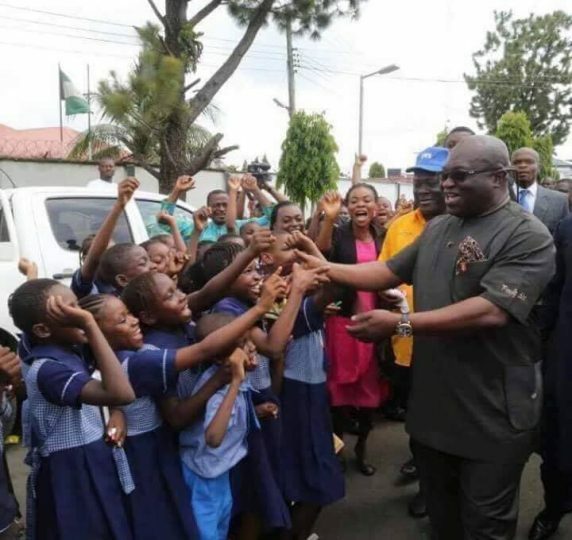 It will be recalled that Governor Okezie Ikpeazu launched the first school feeding program in the state before the federal government keyed into the program to feed pupils from primary 1-3 while Abia State Government is the only state in Nigeria feeding primary 4-6 pupils. The governor also constructed 304 new classroom blocks across the state and engaged Australian education providers to train and retrain primary school teachers in the state. The efforts of the governor have ensured that public school enrollment in the state moved from 142,000 in 2015 to the current level of 648,271 pupils. Four new model schools constructed by Governor Ikpeazu are expected to be commissioned in December 2018 with teachers’ quarters, science laboratories, electronic and regular libraries as well as other modern teaching and learning materials with a good ambience for learning, all within fenced academic environments to ensure security.